Žďár nad Sázavou (Czech pronunciation: [ˈʒɟaːr ˈnat saːzavou]; German: Saar) is a town in the Vysočina Region of the Czech Republic. 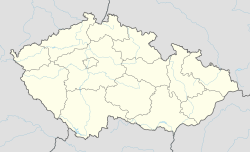 It has approximately 24,000 inhabitants and is the administrative capital of the Žďár nad Sázavou District. The city is a prominent centre of tourism, as a cross country ski resort in winter and a popular destination for cycling and bathing in the summer. It is also situated on a major rail link between Prague and Brno. This is the site of the Basilica of Our Lady of the Assumption and St. Nicholas as well as a branch of the Czech National Museum, the Museum of the Book. The Baroque library of the former Capuchin Monastery in Roudnice nad Labem has been reconstructed, along with the library of the Czech historian, Gelasius Dobner, a beautiful, classical interior, and the library of the Mladá Vožice Chateau. Especially interesting are the collection of printing pressed and technology, and the reconstruction a medieval Scriptorium. Villages Mělkovice, Radonín, Stržanov and Veselíčko are administrative parts of Žďár nad Sázavou. The Pilgrimage Church of Saint John of Nepomuk, one of the World Heritage Sites, is situated there. A school in the town was the location of an October 2014 knife attack, resulting in the death of a 16-year-old boy as well as injuries to three other pupils. ^ Willoughby, Ian (14 October 2014). "Boy of 16 killed in school knife attack". Radio Prague. Retrieved 16 November 2014. Wikimedia Commons has media related to Žďár nad Sázavou. Wikivoyage has a travel guide for Žďár nad Sázavou.